Healing our world, one person at a time. What are the Benefits of Tai Chi and Yoga? You can read more about Tai Chi and Yoga by CLICKING HERE. Thanks for stopping by. If you are interested in finding out how our healing practices work please sign up to our monthly newsletter ‘Confessions of a Misguided Monk‘ or email me directly at info@universalenergyhealing.net. Please, keep in touch. Share a comment or questions and I will get back to you. Click here to read The Big Idea – it may help you to understand more about our healing philosophy. What are the Tai Chi Benefits for Seniors? Where ever you travel in the Far East you’re likely to see images similar to this. Groups of people gathered in open spaces going through what looks like a slow motion dance routine. Look even closer and you’ll probably see that most of the participants are ‘mature’ adults. What is this strange art they are practising and why is it so popular amongst the older generation? The movements are from the ancient Chinese practise of Tai Chi Chuan, most often referred to simply as Tai Chi (‘tie-chee’). 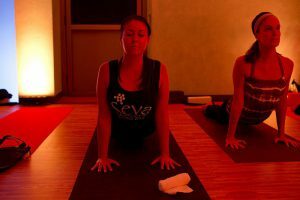 They consist of slow, fluid movements performed with concentration and focus, thus allowing practitioners to fully exercise the mind as well as the body. It is Tai Chi’s focus on mental health, physical fitness, and general well-being that make it such an excellent activity for seniors seeking to maintain functional fitness levels and a positive mental outlook. The low impact nature of the exercise makes it kind on the joints, a key benefit for seniors. I only fully appreciated this particular benefit of Tai Chi in my early fifties; after thirty years of teaching traditional Japanese martial arts my joints were suffering badly to say the least. Getting out of bed in the morning was not a pretty site as I gingerly coerced my stiff and sore joints slowly into life! A drastic decision had to be made. I abandoned my former training in favour of Tai Chi, an art that I had dabbled with as a much younger man. Within a very short period of time my joints started to regain some of their former spring and suppleness and I have continued to maintain this improvement since. One of the great things about Tai Chi is that it requires no specialist equipment and can be done in a minimal amount of space. Traditionally they say that Tai Chi can be practised in the space that an oxen would take up if it was lying down – about the same footprint as a three seater sofa or couch. These characteristics make this form of exercise especially accessible to seniors; they can learn the forms and transitions in a class and practise at home whenever they wish. 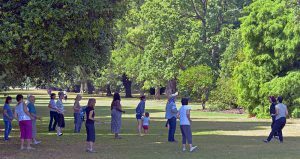 Although Tai Chi is essentially a solo exercise, we can see from the photographs that it is usually practised in a group setting. Learning Tai Chi therefore serves another really important function for many senior citizens – allowing people to socialise and bond together in a shared activity. Because there is no sense of competition in Tai Chi, everyone develops their own way of doing the form and experiences the benefits of the art together. It is partly this sense that everyone’s Tai Chi is ‘right’ that allows a group to practise with a real sense of shared endeavour and harmony. Socialising with peers in this way is well known to improve the quality of life for all ages, but becomes particularly important to older adults who may feel more lonely or isolated. We are holistic beings and our emotional health greatly impacts our physical body. Happy, fulfilled people of any age do tend to be healthier; whether we like it or not, our sense of happiness is closely linked to the strength of the relationships we have in our lives. Seniors who practise Tai Chi regularly gain strength, endurance and improve their balance. They also greatly reduce the risk of bone density loss. 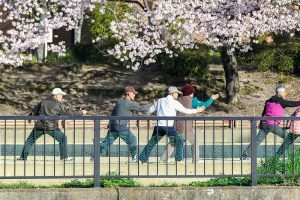 Although low-impact, Tai Chi is still a weight bearing form of exercise as practitioners move with, against, and through their own body weight. Weight bearing exercises are well know to build and maintain bone density, something that is particularly important for seniors 65 years and older. As an aside, this can also be an important benefit of Tai Chi practise for women who are menopausal and at an increased risk of developing osteoporosis. Beyond bone health, Tai Chi builds strength in the legs and lower body. It also strengthens the ankles and knees, which increases balance and stability in movement. This becomes of major importance as we get older and greatly reduces one of the problems of more advanced years, the increased risk of a serious fall. According to the Centre for Disease Control and Prevention in the USA, one out of every three adults aged 65 or older experiences a fall in any given year. These falls can often lead to quite significant injuries in the elderly that include head traumas or broken bones, particularly broken hips. The US Surgeon General’s Report on ‘Bone Health and Osteoporosis: What It Means to You’ states that elderly people who suffer a broken hip are four times more likely to die within the three months following the injury. Elderly people who recover from hip fractures often experience continued health complications for the remainder of their lives. By way of illustration, my aged mother managed to break her hip twice within the space of a few years. Although she was fortunate and did recover, she still walks with quite a marked limp. Considering where she was after the second break, the fact that she walks at all is something of a minor miracle but the damage done in the fall definitely impacted the rest of her life. If you are already wheelchair bound and think there is no way you could do Tai Chi at all then you may be surprised to know that it can even be done from a wheelchair in an modified form. Assisting sufferers of Multiple Sclerosis and Parkinson’s disease. Improves cardiovascular health by encouraging deep breathing. Help with pain relief from conditions like arthritis. Promote recovery following a heart attack or stroke. In addition, has been shown to reduce risk of stroke in high-risk patients. We have seen how Tai Chi can provide a simple, enjoyable, and accessible way to offset and prevent many of the health concerns faced by those of more senior years. The benefits of this ancient activity go way beyond the physical and can have huge mental advantages too. Studies have shown Tai Chi actually improves brain power and memory. In one study, subjects who did Tai Chi were able to increase grey matter in the brain by as much as 40%! 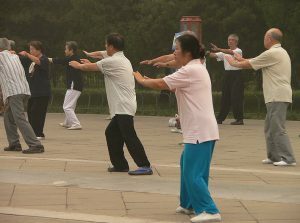 Could regular Tai Chi practise help prevent or slow that other scourge of old age, dementia? The integration of mind and body during a Tai Chi session does seem to engender a general sense of mental well being in practitioners. This aspect of the practise also alleviates the symptoms of stress and improves general mental capability and concentration. 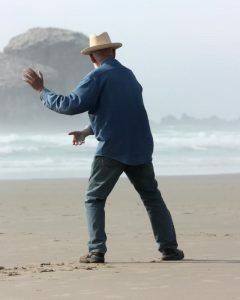 Tai Chi Benefits for Seniors? The Verdict. If 60 is the new 40 then 80 must be the new 60! 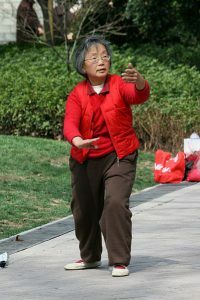 The simple practise of Tai Chi can help make these extended golden years for us all an experience of great quality. It can, quite literally, add years to your life and life to your years. Thanks for stopping by. If you are interested in finding out more about how Tai Chi practise can benefit you please sign up to our monthly newsletter ‘Confessions of a Misguided Monk‘ or email me directly at info@universalenergyhealing.net. Please, keep in touch. Share a comment or questions and I will get back to you. Click here to read The Big Idea – it may help you to understand more about our healing philosophy. Tai Chi vs Yoga – Which is Best? Having owned and run a Martial Arts and Fitness Centre for many years I have a confession to make. Although I believed implicitly in the value of exercise, and was acting from the best knowledge I had at the time, I realise now that most of the training advice I dished out was simply wrong. It was wrong because it was based around short term thinking and a view of health and fitness that was way too shallow. The type of overtly physical training we focused on was simply not sustainable beyond middle age and only concentrated on developing external strength and musculature. It was only as I arrived at my mid-fifties, with joints that were destroyed through over-training and things starting to go wrong throughout my body, that I realised the error of my ways. It was definitely time for a re-think. My choice was to either resign myself to becoming a couch potato, or find an activity that I could practise comfortably for the next 25 years. You may have arrived here today for similar reasons. 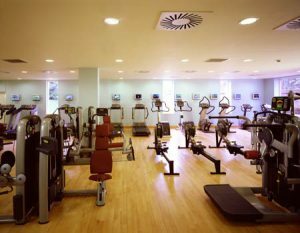 Perhaps you are not as young as you once were and the thought of fitness classes of a gym membership is simply no longer appealing. Maybe that type of fitness was never your thing anyway, and you are looking for an alternative solution. Whatever your current thinking you may be researching the benefits of Tai Chi vs Yoga and wondering which of these two alternative practises would be the best one for you. Yoga and Tai Chi are actually very similar in many ways. They both share many of the same mental and physical benefits and come from what might be called the Eastern mind-body tradition. Tai Chi emerged in China while Yoga developed in India and both arts can trace their roots back some 5,000 years. They both integrate breath control, meditation, and set poses or positions to facilitate health and longevity. Finally, both practises acknowledge the existence and importance of a universal life force or energy that facilitates wellness throughout our total body system. Called ‘Chi’ in Tai Chi and ‘Prana’ in Yoga, it is the successful management of this energy that is seen as the real key to our health. That said, Tai Chi and Yoga do differ in significant ways. Firstly, they differ in intent. 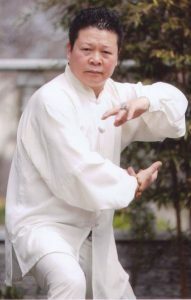 Tai Chi is focused on managing the flow of the universal energy for complete health and well being. In its original form it is also a very potent martial art intended for use in actual combat, although it is now largely now taught solely as a form of slow meditative movement promoting health and wellness. It is probably the case that the vast majority of Tai Chi teachers operating today do not know the lethal combat applications of the movements they make in each lesson. Tai Chi is about balancing the flow of chi around the body. Practitioners are encouraged to breathe slowly, deeply and naturally as they work through the sequences of graceful movements. Most Tai Chi movements are performed slowly from a standing position and take the body through its natural range of motion. Each individual pose is choreographed to flow seamlessly into the next in an unbroken sequence of movement. 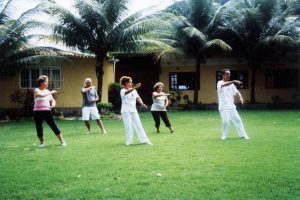 One of the great things about Tai Chi is that it can be practised by any age group and by people of almost any fitness level. The most popular sequence of Tai Chi is the 24 Form, which, once learned, takes about 6 minutes to complete. It can be easily incorporated into a busy lifestyle or become part of a diverse fitness regime. Studies have also shown Tai Chi can support the functional capacity of women with breast cancer, prevent strokes in high-risk patients and ease post stroke symptoms. Tai Chi also been shown to help with the symptoms of Parkinson’s disease. In its original form,Yoga is very much a spiritual practise. It focuses on facilitating the union of body, mind and spirit, leading to eventual enlightenment. The word Yoga actually means ‘union’ or ‘connection’. Although Yoga also uses controlled breathing with each movement it applies this in a slightly different way. The poses are often held for a certain number of breaths rather than flowing from one to another on each breath. While both practices improve physical strength and endurance, both are low impact forms of exercise. However, Yoga can be much more physically demanding than Tai Chi with many of the intermediate and advanced poses requiring significant levels of strength and flexibility to perform. Yoga encourages ever greater levels of flexibility and strength with preparatory stretches, poses and visualisations leading to even more advanced poses over time. So, What are the Benefits of Tai Chi and Yoga? When deciding which art would be best for you there are some questions you should be asking. What are you looking to achieve? Do you want your mind-body practise to focus on physical and mental health and general wellness or would you like an activity that promotes more spiritual engagement? How physically fit are you? Yoga tends to be more physically demanding. The truth is that it doesn’t have to be a choice between Tai Chi or Yoga. They can complement one another beautifully, with Tai Chi boosting meditation progress and Yoga improving physical strength and flexibility more rapidly. Watch a short video on Tai Chi and Yoga by CLICKING HERE. Thanks for stopping by. Remember, whatever your eventual choice you will experience significant mental and physical benefits from either art as both practices provide an amazing integrated health care and healing system for their practitioners. Please, keep in touch. Share a comment or questions and I will get back to you. Click here to read The Big Idea – it may help you to understand more about our healing philosophy. Benjamin Franklin once reportedly said “an ounce of prevention is worth a pound of cure”. Perhaps nowhere is this more true than when it comes to our health; it is unfortunate that we generally only wake up to this truth when something goes wrong with our body and we are forced to seek medical attention. Our past habits always catch up with us eventually, and we are often left wishing that we could turn back time and undo some of the harmful things we have done to ourselves. 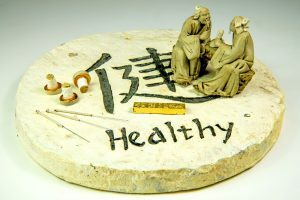 Those who practice East Asian medicine, such as Traditional Chinese Medicine, have a strong focus on the prevention of disease through various practices such as Chi Kung (Qigong), Tai Chi, and meditation. In contrast, Western medicine generally steps in post symptom, after the damage has been done. In relatively recent times doctors do seem to be taking more interest in preventing disease, but we are a long way behind traditional Asian medicine. The inevitable conclusion is that Chinese exercise for health and wellness may offer a real alternative; one that may enable us to live more healthily and for longer. To appreciate the power of these exercises we need to understand something of the philosophy from which they stem. Chi, Qi or Ki – It’s all about Energy! Eastern Medicine is based on the premise that we all have an energy force called ‘Chi’, the flow of which keeps our organs and body systems functioning optimally. By regularly practising certain exercises, along with acupuncture and various herbal practices, the flow of this chi energy is stimulated in the body and the various diseases that can occur do not happen. The key concept is that people who are already healthy should engage in these practices in order to stay healthy and free of disease. Chinese medicine is also holistic in nature, treating the entire person, mind, body and spirit. It focuses on returning the whole person to a place of wellness. Conversely, Western medicine looks at symptoms, treating the disease and not necessarily the person. This typically means either a prescription, or surgery to target the main problem, instead of addressing any underlying causes or issues that may have caused the disease to begin with. While Western medicine is probably a step ahead of Eastern medicine when it comes to the science of healing illnesses, there has been far less attention paid to prevention and targeting the holistic wellness of patients. Eastern and Western medical practices began to come together when missionaries from the West traveled to the East in the 18th and 19th centuries. By the beginning of the 1900s, Western medical schools began cropping up in China, spreading their knowledge to Chinese culture. It wasn’t until the latter part of the 20th Century that Westerners began to look at the possible benefits of the various Eastern practices, including Chi Kung, Tai Chi, Meditative practices, and Acupuncture. Surprisingly, it was found that both types of medicine—East and West—were found to help people heal and feel better. In fact, they found that both of these practices could be helpful in preventing and curing illnesses. Now the potential has become a reality as both Eastern and Western medical practices are used in the management of many kinds of disease. We are now fully recognising the advantages of preventing disease and strengthening the body against disease with natural methods and regular practise. Western doctors now have the opportunity to ‘prescribe’ acupuncture for the management of disease and have begun to see the benefits of exercises like Tai Chi and Chi Kung. Among other things, these Eastern practices have been shown to regulate sleep, lessen pain, and decrease the side effects of Western medications. While there are still those who practice just one form of medicine, more and more Western doctors are trying to incorporate elements of traditional Chinese medicine into their Western medical practices. More and more people are beginning to embrace the joining of these two medical practices. Acupuncture works to reduce pain and corrects disorders of other parts of the body. Tai Chi improves overall health and has been shown to delay the effects of ageing, by noticeably improving flexibility, coordination, posture, and memory. Tai Chi is also very effective in fighting stress that in turn provides a wide variety of health benefits. Many of the treatments of Western medicine verge on the miraculous and the skills and dedication of our doctors should not be underestimated. We certainly would not want to throw the baby out with the bathwater, so how can we best combine the benefits of Chinese exercise for health and wellness with Western medicine? It seems to me that the key here is for all of us to take personal responsibility for our own health. We each need to do what we can to prevent illness and disease at every level of body, mind and spirit. Too often we live without much care for the damage we are doing to our body and only seek medical help when things go wrong, expecting the medical team to sort in out for us! Practitioners of Traditional Chinese Medicine use their health promoting practices to prevent diseases from happening all together. This leads to a sense of control, facilitating a greater sense of total body wellness. By using these various exercises in conjunction with Western medicine we are quite literally getting the best of both world views. With time the practice of Tai Chi and Chi Kung can add years to our life and life to our years. Thanks for stopping by. Remember, the single most important step we can take is to take responsibility for our own health. Taking up a programme of Tai Chi and Chi Kung can help greatly and the benefits will soon become apparent in your life. Please, keep in touch. Share a comment or questions and I will get back to you. Click here to read The Big Idea – it may help you to understand our healing philosophy. Mindfulness has become something of a buzz word in recent times with lessons and classes popping up everywhere. It seems that our fast paced world has created something of a monster, with stress related ‘dis-ease’ almost endemic amongst our population. 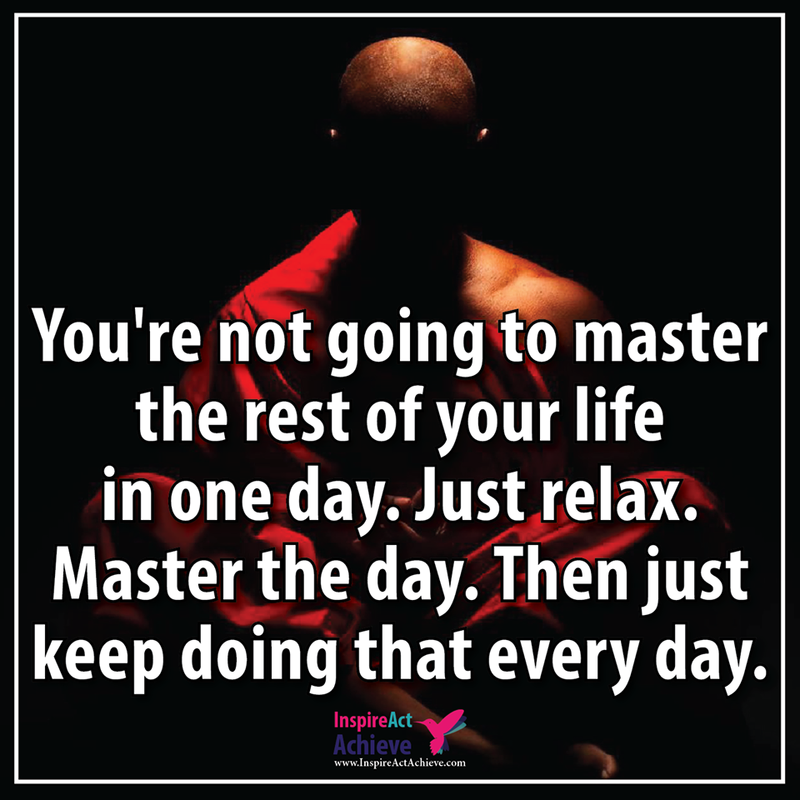 It is perhaps somewhat ironic that an answer to the daily stress we feel may have been with us all the time. The ancient art of Tai Chi provides a simple and readily accessible activity that allows people to decrease stress and anxiety by slowing the pace at which theeir mind and body functions. This article explores the benefits of using Tai Chi stress relief solutions as an alternative to some of the less healthy activities we often indulge in! So Busy Making a Living That We Forget To Make a Life. We live such hectic lives, rushing through the day from work, to collecting the kids and then hurriedly racing home to make dinner for the family. How often do we actually stop and just breathe? This fast paced lifestyle certainly takes its toll on our health and general wellness as we constantly seem to be on alert, working out what we have to do next. Can I get this report finished on time? Do I have time for lunch? Ahhh! This traffic jam will make me late for my meeting? We spend so much of our day in this hyper-alert state that our stress response is running almost flat out. As we hit a chronic state of fight, flight or freeze, joy itself seems to evaporate from our lives and happiness becomes a distant memory; something we left behind in our childhood but definitely not something that is a permanent part of our adult life. One of Tai Chi’s foundational components, deep breathing, immediately slows the body and the mind by disengaging the fight, flight or freeze response and activating the relaxation response. The mindful awareness achieved when performing the slow movements of Tai Chi allows a person to disengage from stressful stimuli and stressful thought patterns and facilitates a calm and relaxed mind. 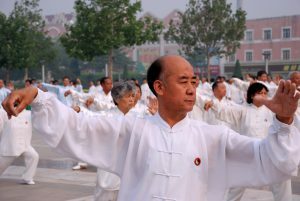 Connecting with the breath is one of the first activities performed during a Tai Chi practice. Once a practitioner establishes their stance, they allow their breath to deepen and slow and endeavour to maintain this style of breathing throughout the practise. This type of breathing turns on the parasympathetic nervous system, eliciting the relaxation response in the body. This has the opposite effect to the sympathetic nervous. The sympathetic nervous system activates the ‘fight, flight or freeze’ response, whereas the parasympathetic nervous system soothes and calms the body. Practising deep breathing alters the way the body reacts to stress; fight,flight or freeze ceases to be the default response to any stressful stimuli. Tai Chi practitioners perform each of the poses in the various Tai Chi forms slowly and with great focus. They will narrow their perception to their immediate actions and surroundings. For example, they focus on where their feet meet the ground or the sensations associated with shifting their weight from one foot to another. As they lift their arms, they may note the way their hands look and the way the muscles of their shoulders and upper back feel as their arms rise and fall. With practise this elevated concentration becomes effortless. Once memorised by the mind as well as the body, muscle memory comes into play, which allows long-term practitioners to find a meditative state. Their attention shifts from the mechanics of the practice to its content; from the how to the what of being in the present moment. The intellect ceases to name an object, idea, or activity and the practitioner experiences an expansive awareness. In this way Tai Chi becomes a moving meditation experience! 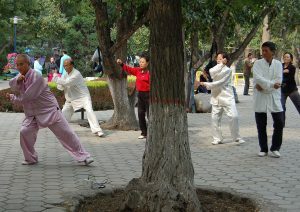 Just because Tai Chi is practised slowly and as a form of moving meditation doesn’t mean it is a soft or weak option. It still has many of the same physical benefits as traditional Western exercise. These benefits include building strength and flexibility, stress reduction, improved cardiovascular function, improved immune system function, improved sleep and a general sense of well-being. And it accomplishes all this with far lower physiological impact. Unlike many traditional exercise systems, your body will thank you for it as you age! Tai Chi’s slow and repetitive nature makes it simple to learn. 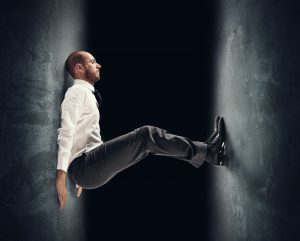 The practice does not require any special equipment and you only needs a few feet of space in which to move. It provides an effective and proven approach to physical fitness, mindfulness, and meditation and does this by combining deep breathing with focused movement. It is suitable for all ages, all fitness levels and in many cases can even be practised by people with limited capacity for movement. Finally, practising Tai Chi can definitely reduce the way your body reponds to the stresses and strains of life, leading to greatly increased levels of physical and mental well-being. Thanks for stopping by, I wish you all the best as you research your own path to reducing the stress in your life. Please, keep in touch. Share a comment or questions and I will get back to you. Click here to read The Big Idea – it may help you to understand our healing philosophy. Confessions of a Misguided Monk! Subscribe to our monthly newsletter on all things relating to energy healing and the traditional warrior arts. Q: What happens at the McLeod-Tyler Wellness Center? What kinds of services does it offer?